Enide - Eclipse Node.js IDE (based on Nodeclipse 0.17) Eclipse Node.JS IDE (Enide) is basically one configuration file (*.p2f) that lets you quick start with Node.js development. 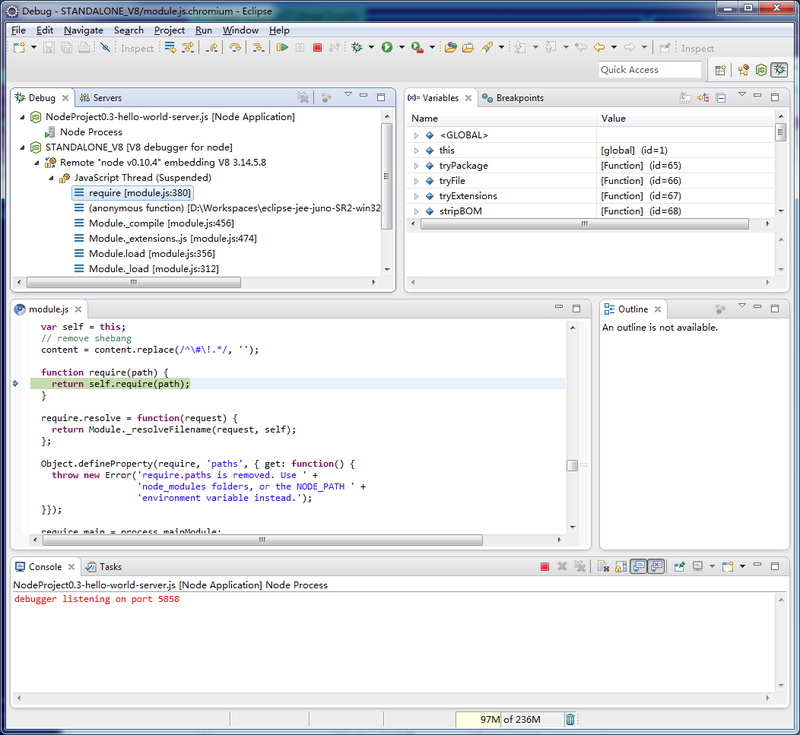 Link to file: https://raw.github.com/Nodeclipse/eclipse-node-ide/master/ENodeIDE.p2f See also Enide Studio 2014. You can install main plugins with update site or using Install button, however if your Eclipse is not downloaded from www.eclipse.org (e.g. Aptana, Zend Studio, Adobe Flex Builder or others), then it cannot automatically resolve needed dependencies. That is why this solution was created. There is also update site archive on SourceForge. (Once again: it will be not all plugins, but once you get .zip, you will only need Internet access if your Eclipse instance doesn't have required dependencies) Included plugins are - Nodeclipse Plugins List (Optional) - Marketplace client - Nodeclipse What's new - Chrome Development Tools, fixed for debugging Node.js - MarkDown (*.md) Editor (needed) - GitHub Flavored Markdown (GFM) Viewer (needed) 1.8.3 - Eclipse Color Theme (Optional) - Jeeeyul Eclipse Themes (Optional) - Eclipse QuickSearch (Optional) Ctrl+Shift+L - InstaSearch (Optional) Alt+I - Glance (Highlight anywhere, Ctrl+Alt+F) - JSHint Eclipse Integration (Optional) 0.9.9 - jQuery Integration (Optional) - JSON Editor Plugin (Optional for Outline) - JSDT Kepler, Indigo - NJSDT (JSDT alternative when JSDT is not installed) - NJSDoc library (only for/required by NJSDT) - Eclipse Regexp - RestClient Tool (Optional) - ShellEd (Optional) 2.0.3 - StartExplorer (Optional) - Nodeclipse Git Addon (Optional) - CoffeeScript Editor (Optional) - TypeScript Editor (Optional) - Eclipse RegExp (Regular Expression View) - MongoDB (MonjaDB) - Nodeclipse MongoDB Shell Integration - Nodeclipse Java 8 Nashorn JJS - Nodeclipse PhantomJS - JSDT for Closure, - Closure Templates - LESS - Zip (and Jar) Editor - TCF Terminals To install - save file with *.p2f extension - In Eclipse, use File -> Import \ Install Software Items from File - select needed components (if your network connection is slow, select less items in one time) All instructions are also inside .p2f file, that you can view with any text editor. And then possibly email to friends or colleagues. No need to remember all those update sites and names. Contact author when you know something worth to be included. Or add review below. See also Hints and Online Help ATTENTION: 1. versions since 0.4 require JSDT. If your Eclipse was not downloaded from www.eclipse.org, then possibly you can't get this dependency automatically. See #46 Aptana Studio - can't update to 0.4 for solution. (NJSDT+NJSDoc is recommended for this case) 2. versions since 0.4.20 includes CoffeeScript Editor that requires XText. Solution is similar, i.e. install XText before if you can't get it automatically. Please vote (be sure to register and log in before). Say thanks and support keeping this project updated Donate Bitcoins Listed in Nodeclipse Plugins List. By adding the following code below to your website you will be able to add an install button for Enide.p2f - Eclipse Node.js IDE.